Long travel extensometers are ideal for use when testing high-elongation materials. 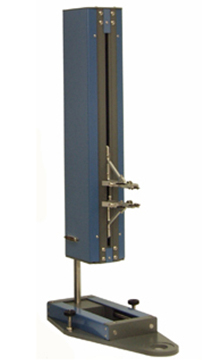 We provide two long travel extensometers for materials testing; the EZ250Plus and the EX800Plus. The first type is specifically aimed at the plastic and rubber industries to provide accurate readings of strain and extension over a large extension range. The unit, incorporating two clamping arms and precision potentiometers, produces a DC voltage proportional to the distance between the arms. This generates accurate readings of percentage strain and allows additional parameters such as yield point and break points to be calculated when used with NEXYGENPlus software. The second type is suitable for use with rigid, semi-rigid and ductile materials. The extensometer is supplied with a universal voltage external power supply unit, a loom and a connector to fit a range of machines, as well as a mounting stand.